Please note: You don't need to have a Paypal account to shop at our store. 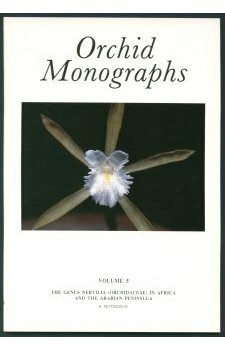 The orchidaceous genus Nervilia Comm. ex Gaud. is revised for Africa, including Madagascar and other islands, and the Arabian peninsula. Sixteen species are recognized, two of which are each subdivided into two varieties. Keys are presented for all taxa. Lectotypes or neotypes are given for all relevant names from Africa. For each species full synonymy, description, distribution map, notes on habitat, flowering time etc. and a line drawing are provided. All species but two are illustrated by colour photos.